Step 1: Put the 18650 Battery in this case(Do Put it right " ""-" Battery not included). Perfect item for DIY and for your own use! Amp: 5V 2A; max load is 25W. Step 3: Put the Screws on, then everything is ok. | eBay! It’s a power bank with 8-24V adjustable output that provides up to 25W. Takes 4x 18650 cells and charges at 8.4V. With common 2500mAh high-drain 18650s it should provide over 30Wh of energy and handle most radios on 5W. Not sure how well the cells are protected or what kind of battery management it uses. Be careful, the invertor used to take the 5/6v up to the 8-24V output could produce a lot of RFI across the HF bands. Some of these "Buck convertor"s, are very noisey, Some are just noisey and a very few are quiet. It sounds like you will need to buy a 8.4 volt charger in addition to this kit as it’s not included. And the power delivered on the 12 V outlet might be quite limited. I could not find any values. Step-up conversion as said might be causing interference problems. Some boost converters are surprisingly RF quiet. I bought some 5A rated units from eBay (about €3 each inc p&p) to drive from my 3S LiPOs to geneate 13.8V for my 13cms transverter which has a PA that is more voltage dependent than my 817. Even when the boost converter is powered and sat under my HF antennas when portable, I cannot find any noise output from it tuning about. They are claiming 25W output … that’s roughly 2A at 12V. Not sure if that is a hard wall or an average, the search for “SA1328” doesn’t come up with anything and I can’t read the other chip. I assume that’s a thermal limit (no heatsinking) as chips in that type of packaging can usually provide much higher output power (up to 100W). I’ve used one of those cheap eBay DC-DC converters (added choke ferrites on both input and output) to power the “sensitive” stuff in a homebrew transceiver (FPGA + ADC board) and it doesn’t seem to add any extra noise compared to a linear regulator. Implementing even basic measures for conducted / radiated EMI is normally enough to stop any significant noise, I found. 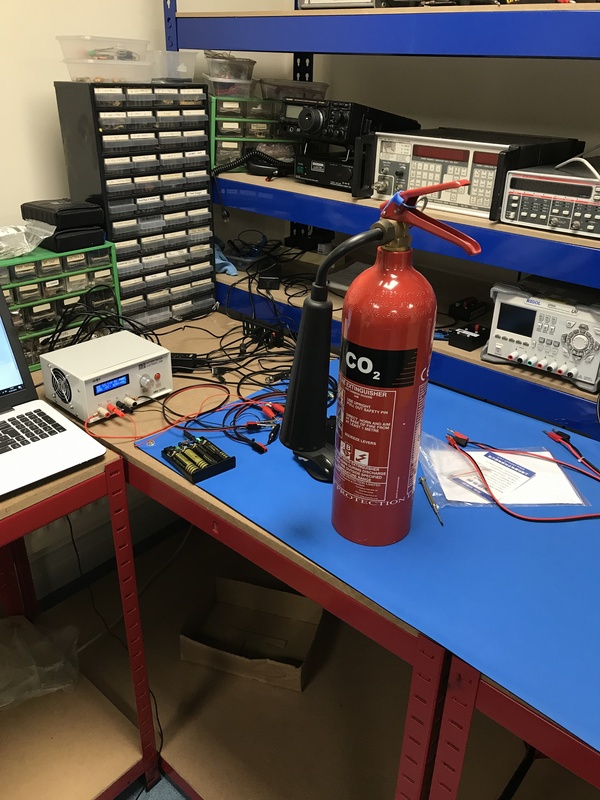 In the lab at SOTABEAMS today. Nice, very curious to see the results, especially EMI and current output. Well it has delivered 1 Amp for about an hour so far so not to shabby. The output voltage has risen slightly - presumably due to the regulators warming up. 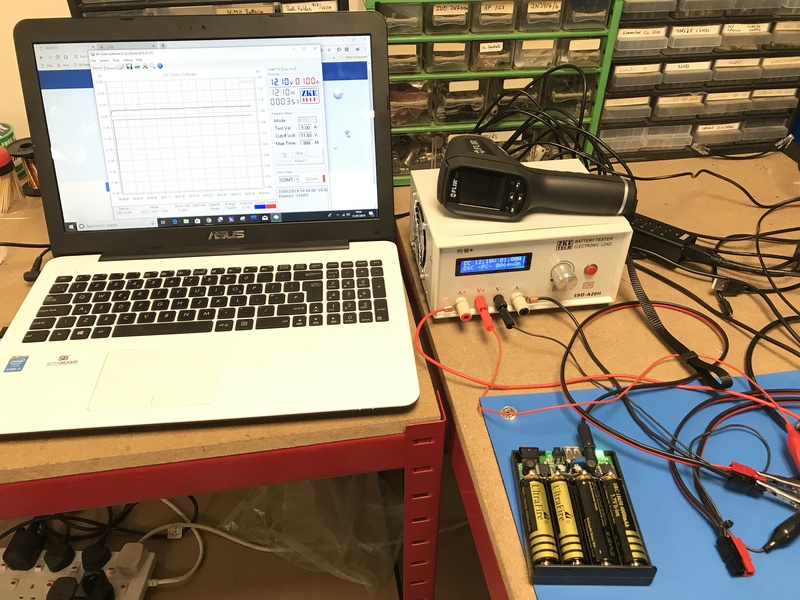 The switch-mode regulator and associated choke are running at just below 70c - that’s fine in the lab but might not be good if the pack was out in the sun. 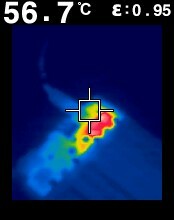 The cells are warming up a bit too. That sounds fine, it’s more than any 5W radio will pull on average. Can you try 2.5A continuous for 15 seconds at 12V output ? It ran out just after an hour. Now charging. My electronic load is programmable so I should be able to emulate an 817 RX and TX. Some boost converters are surprisingly RF quiet. I bought one of those cheap 2-3 amp step down converters with an led readout from Ebay. 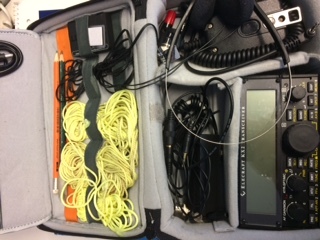 Like your unit, I found no noticeable noise on 7MHz where I tested. However, there was a very narrow signal about 10 KHz below my QRG on transmit which matched the CW I was sending. I doubt whether it would cause any interference to either the op or other users. It would have been very local in effect, and was tiny considering the antenna was only 4m over the source. Perhaps someone with more technical knowledge knows what it might be. When I get round to making an enclosure for the pcb I will use it with a 6s pack I made from recycled laptop cells. This is the 1 Amp test curve. Of interest is the capacity - only a little over 1Ah. 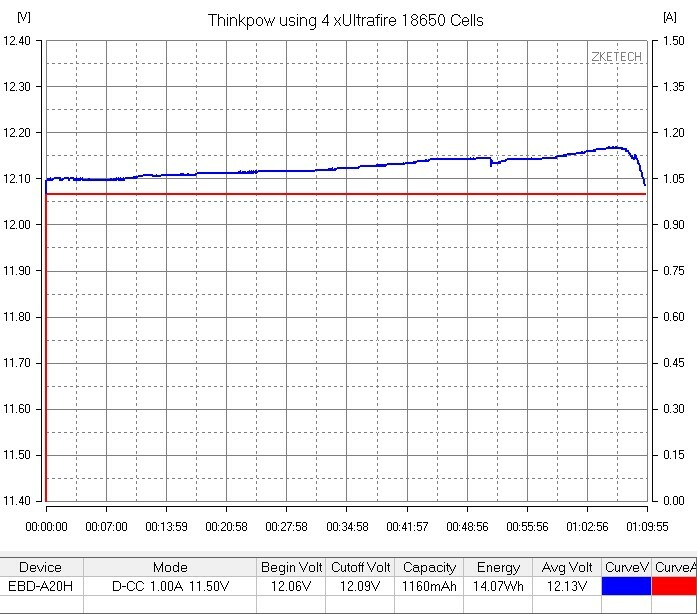 That looks bad, I would’ve expected about 30Wh (4 cells * 3.7V * 2200mAh real capacity * 0.9 step-up efficiency). The efficiency can’t be too bad because at more than a few W of dissipation the IC would melt off the PCB, so I’m guessing either there’s something off about those cells or the low cut-off voltage is too high ? Having had a similar device back in 2015 I would say performance is 100% dependant on the quality of the source voltage ie the batteries you use. If you use elcheapo LiION cells then chances are you will get poor performance. At it’s core it is a DC-DC converter and as far as I was aware at the time on mine (looks very similar) it runs all 4 LiION cells in parallel to source the input voltage for the converter. These things will run warm if you are running at a high current and higher voltage (They were designed originally for 5V I think, might be wrong,the option to go to higher voltages was seen as a ‘useful option’) also any radio might be susceptible to RFI from such a device and common mode chokes usually can deal with any issues. To be honest I never saw issues with mine I set the output to 11V for the ATS rigs. 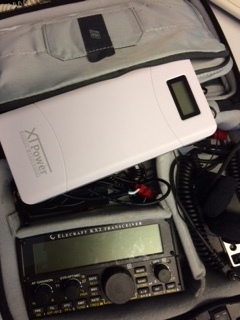 I used to power ATS3/ATS3B and even a KX3 (at low RF powerout). 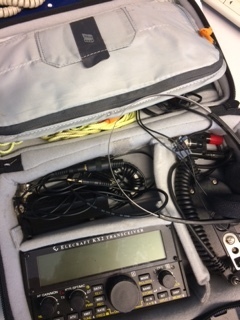 For info… http://m1kta-qrp.blogspot.com/2014/05/ossible-ats-3ats-3b-power-source.html These Richard has looked at seem to use the batteries wired in a different combination perhaps. Mine used them all in parallel and the charge was 1.6A 5V. Perhaps look at the review http://lygte-info.dk/review/Review%20USB%20battery%20box%206x18650%20Qidian%20UK.html of another in the comments off the blog as well. I do not know this unit, but I can recommend you the xt power bank. 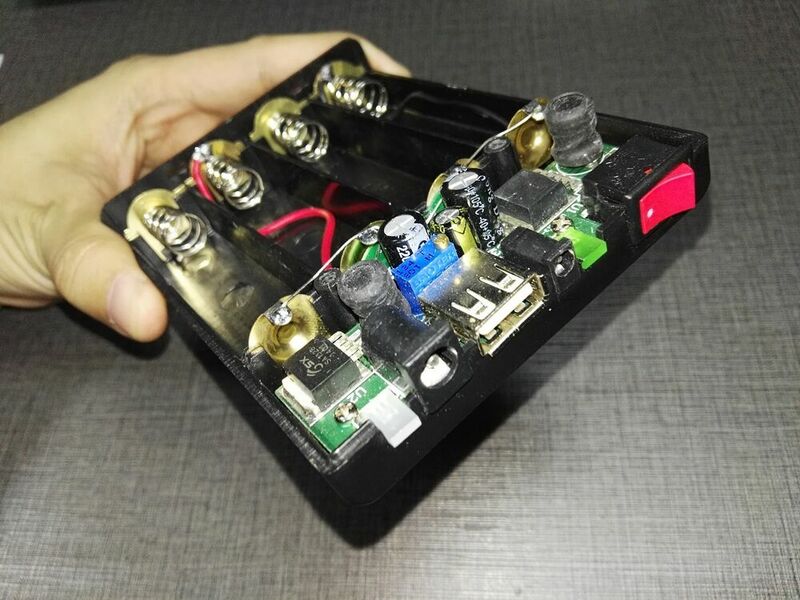 Modern Power Bank with USB QC2 and additional 12V 16.5V 19V 20V 24V output. Powerful high-capacity battery. Order Online Now! That looks interesting. Looks like it can handle the DC input from a solar panel as well. I’ve looked at a few other types of these chargers, and none of the ones I’ve seen could handle the input from solar. Wonder if anyone has tried this out with a solar panel for extended outdoors field operations?